In our experience, you can’t plan a trip to the mountains (in Europe, at least). We are not beach people, we are much more at home in the countryside and there is no more majestic countryside than mountains. The trouble with mountains is that they attract weather. If there is any unstable weather floating about in the vicinity, the mountains will be the first to feel the effect. A couple of times in the last few years we’ve thought, “oh, it’d be nice to go to the Alps/Pyrenees” but, come trip time, the weather on the peaks has collapsed. We went elsewhere since, even with time on your hands, there is little point deliberately driving into bad weather. To capitalize on the mountains, you need to be flexible enough to react when the circumstances (i.e. favourable weather) arise. Today, all our friends were leaving Fanjeaux. One other thing that we’ve learned is that staying on in a campsite after having been in the company of friends is a mistake; in the aftermath you feel like Billy No-mates. That’s depressing. Much better to make a clean break of it and move on so that’s what we wanted to do. Time for our two lessons to come together. We’ve been lucky enough to hit a real Indian Summer. Luc clearly thinks rain is some way off ‘cos he’s watering his fields. For the weekend at least, the weather looks set fair all over France including over the Pyrenees. With cloudless skies, there are few sights more impressive. We’ve decided to head for Bagnère-de-Bigorre at the foot of the high Pyrenees within easy reach of several of the most impressive cols regularly featuring in the Tour de France. Back in the mists of time, Franco and Bagnère-de-Bigorre have met before. My only memory is a frustrating one. It was 20-ish years ago. On that occasion we had first visited the Marais de Poitevin where I enjoyed taking some of my finest photographs (on a real film camera, of course) of the misty marais mornings. Then I snapped my way down the western side of France to Bagnère-de-Bigorre, nestling below the high Pyrenees. We made our way up the imposing Col du Tourmalet where I continued snapping away at the Pyrenean vistas from the highest road pass in the range (2115mtrs/6900ft). I always loaded films of 36 exposures in my camera. It was quite usual to get 37 shots, occasionally even 38 shots from a roll of film. 39 seemed most unlikely and by the time I hit 40 exposures I knew something was wrong. I feared the sprocket holes had ripped through and the film itself was not advancing, only the frame counter. Heart in mouth, I steeled myself and opened the back of my camera. There was no problem with the sprocket holes. Actually, there were no sprocket holes at all; the camera was embarrassingly devoid of film – completely and utterly empty! What a wombat!! Gone were all my prize-winning [Ed: dream on.] shots of the misty Marais Poitevin. Gone were my high Pyrenean vistas. The digital equivalent of having no film might be running out of battery power. I’ve checked it; this time should be more successful. 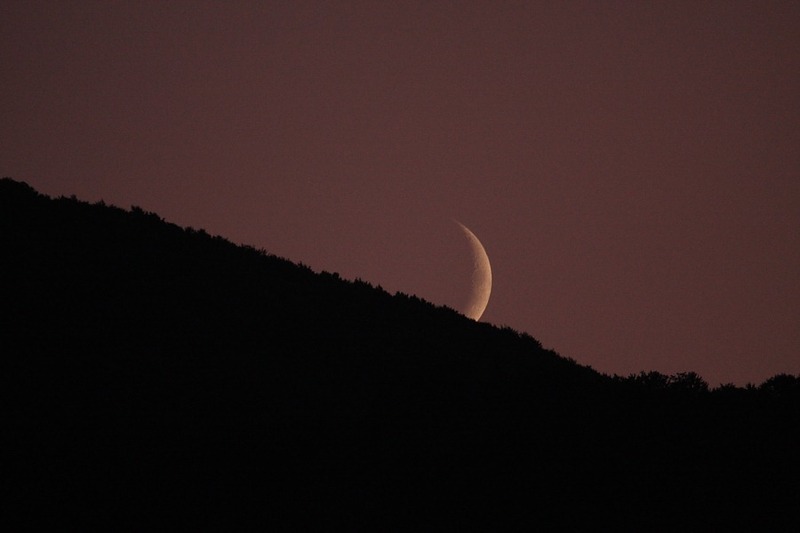 Our first evening on our chosen new campsite provided an interesting test shot: a reasonably new moon just touching the top of one of the lower peaks adjacent to us.